This project is a customized multi-sensory composition (CMSC) composed of unique sensory outputs. These include various visuals (1), an edible scent (2 & 4) & sounds (3) inspired by the mysterious relationship between Putin & Trump. The initial inspiration for this multisensory project was the yanny or laurel clip that was circulated. “Yanny or Laurel” is an auditory illusion of a re-recording of a vocabulary word plus added background sounds, also mixed into the recording, which became popular in May 2018. I listened to the sound clip on various devices having varying sound qualities & was able to hear both yanni & laurel. Like many people, I shared this clip with friends, colleagues & family members. The video clip (below) generally describes the variability in the results that I was able to observe with a variety of people I knew. The main purpose of this project is to (1) compose/formulate a variety of closely linked sensory outputs that can be perceived in different ways & (2) combine all of them into one cohesive sensory expression or customized multi-sensory composition (CMSC), having a distinctive theme. There are two main visuals or optical illusions, inspired by the recent relationship between Donald Trump & Vladimir Putin. Regardless of the political affiliation, one has to wonder how this relationship works, how it will transform the future & why something is starting to stink. Besides personal motivations, is Trump working in the best interest of the United States of America or for Russia? The first visual is a comparative picture composed of two visuals that can be manipulated from left to right. 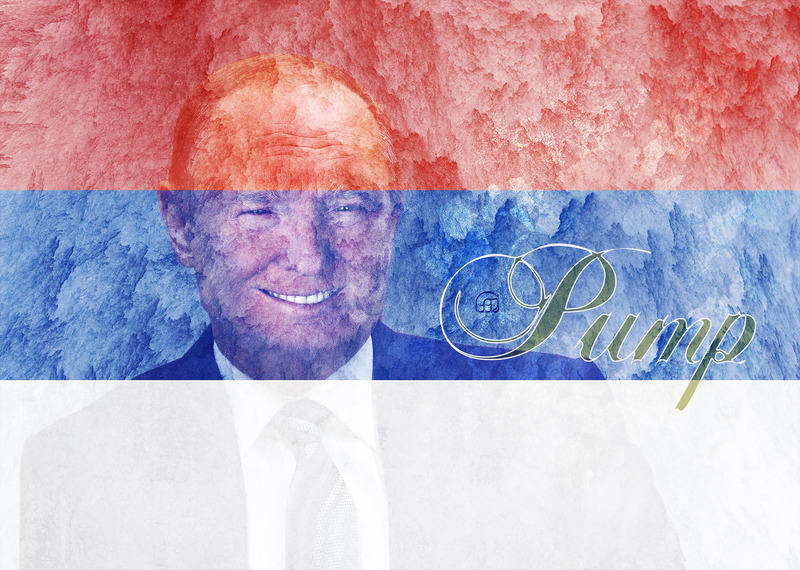 Is it Trump or Putin, or is it Trutin or Pump? Various sensorial elements from both of the main characters of this project have been alternated. The third visual is a literary representation of the first set of visuals. What does one see? 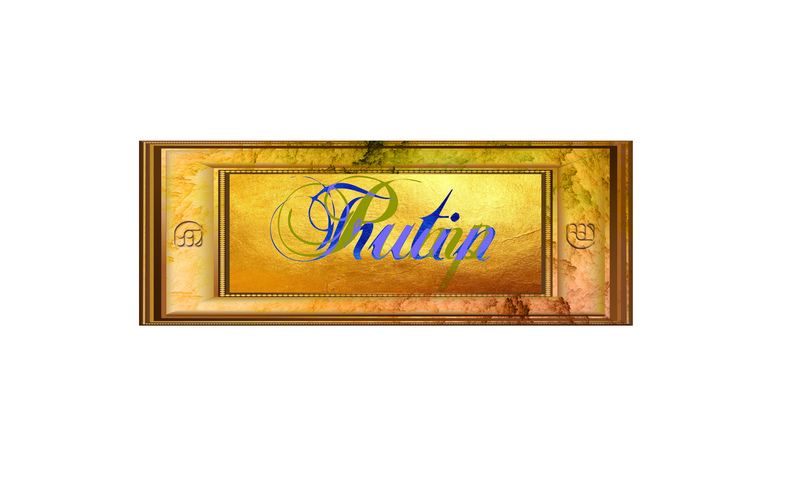 Trump, Putin, Trutin, Pump or something else? “The Kiss of Death” is perhaps the most famous image that appears in Berlin’s East Side Gallery–a nearly mile-long mile stretch of the Berlin Wall. This served as my main inspiration for what I call “The Kiss of Collusion”. It is not an optical illusion, but serves as an additional visual for this CMSC. Original artwork is 83″ x 55″. This visual inspired me to create a longer portion of the Berlin wall (visual 05). 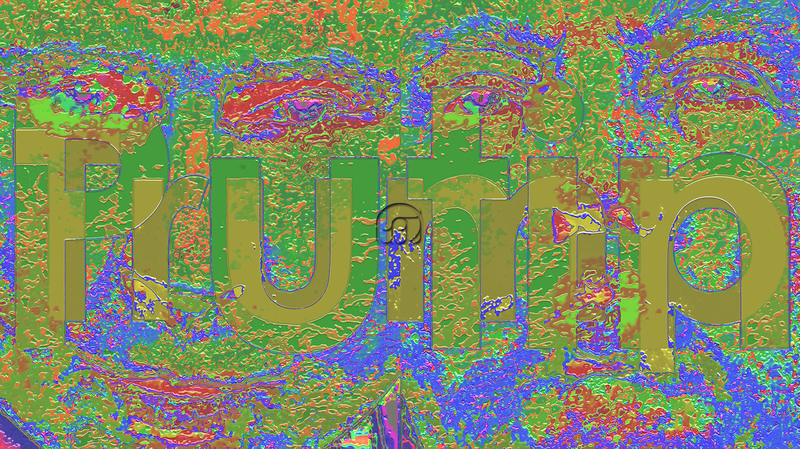 This 20,000 x 5000 pixel visual is composed of 255 layers that represents the mysterious relationship between Vladimir Putin & Donald Trump & the Russian collusion investigation being conducted by Robert Mueller. 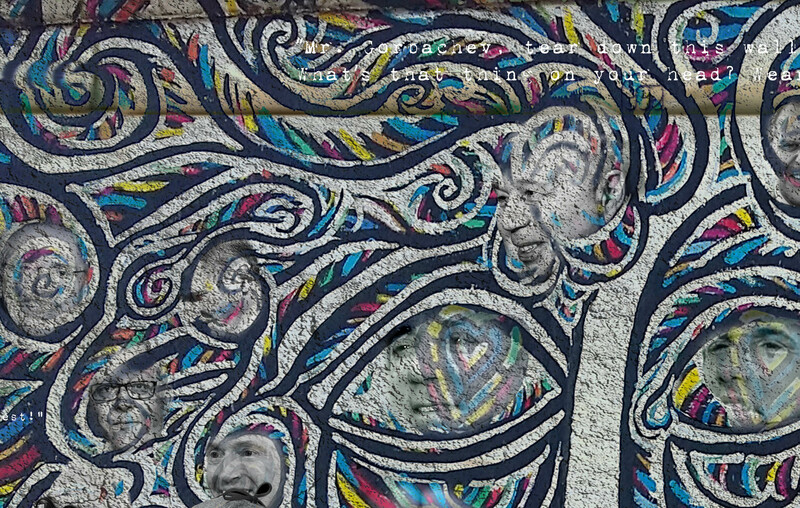 It is set at the east-side gallery in Berlin, 6:06:06 PM, 14th of October, 2018. Most of the characters (visible & hidden) are either involved or linked to the Russia-Trump collusion scandal. The various layers reveal themselves (when magnified & looked at from different angles). Layers not directly related to the main theme have been added to spice up the story. These are mostly based on geopolitics, Berlin, electronica, personal & funny elements (such as Trump mini-me & waldo). Other notable mentions include a prelude to an upcoming project based on Kim Jong-un, a kiss between Mikhail Gorbachev and East German President Honecker, several references to Brett Kavanaugh & some optical illusions. The artwork on the wall is based on or actual famous art from the east-side gallery. It has been used as a canvas that has been mutated. The 255 layers are composed of original creations, modified & original pics. By paying attention to the details, the “Berlin Wall of Collusion” tells the story of the Russian collusion investigation. 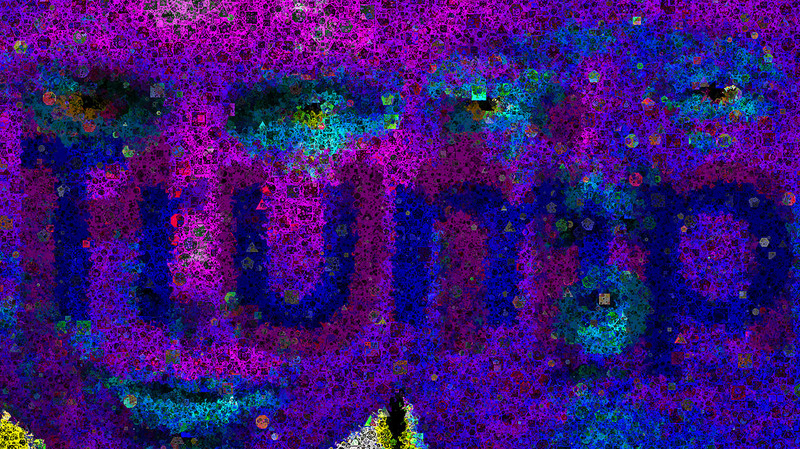 Two small portion of the artwork has been magnified (below) to showcase the level of detail. 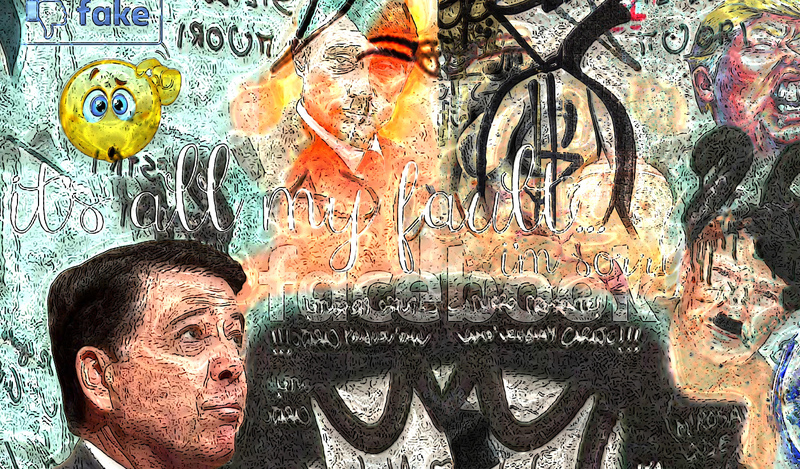 The pic below showcases James Comey & has graffiti of Adolf Trump, Adolf Putin, Donald Trump & various other layers. The centerpiece of the Berlin wall of collusion utilizes a famous portion of some original artwork from the east-side galleries as a canvas. Many of the key people involved in the Russia corruption investigation can be identified. The aroma volatiles responsible for the distinctive odour & taste of onions & garlic are very similar. As such, when they are combined at specific ratios, it is sometimes very difficult to pick out one odour over the other. While there are many other examples of this flavour/smell duality that exist (such as citrus fruits), I have decided to experiment with two much more powerful & penetrating smells & tastes. 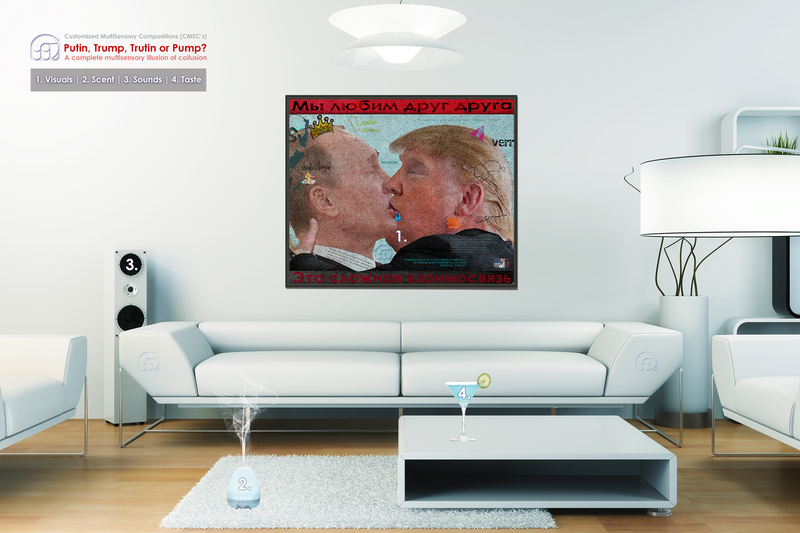 An actual edible fragrance (F25022) was created to represent the unique & mysterious relationship between Putin & Trump. It is described as being “sharp, incendiary, irritating, reactive, stinging, sulfury & harmonious”. Versatile in food as well as a statement perfume. 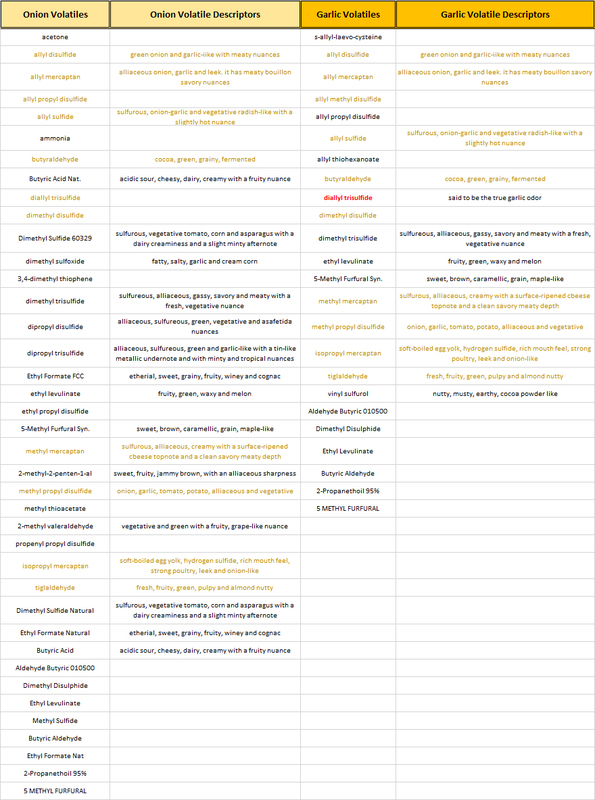 As shown in the table below, the volatile aroma components of garlic & onion essential oils have similarities (coloured chemicals), but like the they also are distinctively different on based on their chemical makeup. They of course have different proportions of identical compounds, but onion oil also contains many more types of volatiles. Yet, when combined together & with other ingredients, a savoury & disgustingly masculine edible fragrance inspires penetrating confusion. Similarly to the the auditory illusion, there are two main sensory cues & some delicate background cues. Sound experiments were conducted to (1) create auditory illusions using various sound samples. These were blended into a full sound composition (2) resulting in more complex auditory illusions that can be interpreted in different ways & ultimately (3) enhance the other sensory outputs for this project. A full multisensory project composed of visuals, audio, flavour & an edible scent. It was initially inspired by the whole laurel/yanni phenomena, which is considered an auditory illusion. Similar to this, the purpose of the project was to create arrangements of sounds, a scent, flavour & visuals that could also be perceived in different ways. 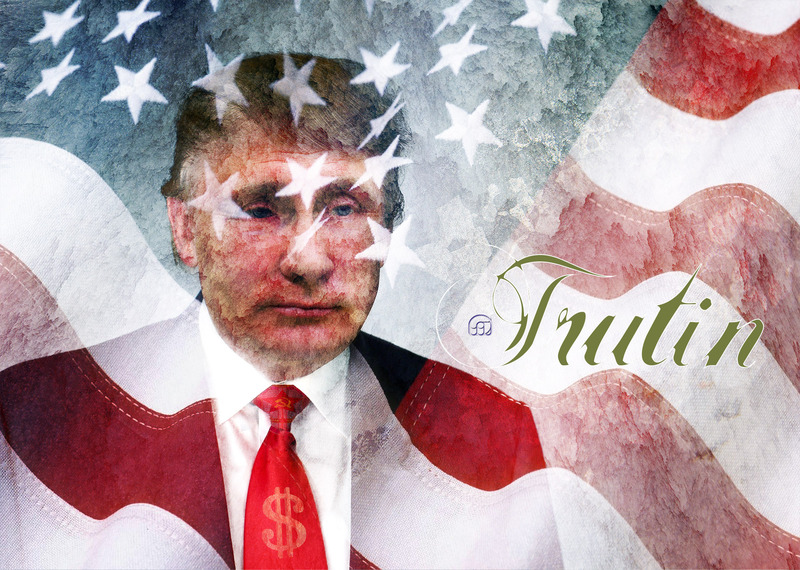 The main theme is the mysterious relationship between Vladimir Putin & Donald Trump as well as the Russian collusion investigation being conducted by Robert Mueller.